A domain name is like your home address on the internet. Even if you are not a company or organisation, so long as you have a website or blog, it’s always a great idea to get your get your domain name. Before we dive into the hows, let’s take a second to ponder the whys. A domain name gives you credibility both as a business and as an individual. Well, most of us don’t ever want to work with folks at your-brand-name.wordpress.com, do we? It’s that much easier to type into your browser than, say facebook.com /profile.php?id=5500957. Best of all, brand new domain names only cost you $10 a year. And if you’re reading this, you’ve probably decided on taking your online project to the next level. In this post, I will walk you through the entire process of getting your own domain name, one click at a time. For starters, getting a domain name is simply claiming the name you want with the Internet Corporation for Assigned Names and Numbers, ICANN for short, through a domain name registrar. If you want a name like your-brand-name.com, you will need to go to a domain registrar and pay them a registration fee of around $10 to $30. This will give you ownership for that domain name for 12 months. To keep this domain name, you will have to renew your payment every year. Or build a new site and buy a domain name. 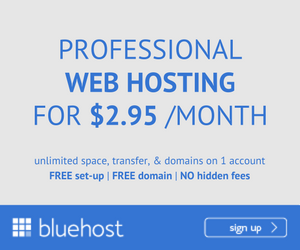 If you want to build a new site, there are a lot of web hosts out there like BlueHost that gives you a free domain name once you sign up. Click here for a throughout guide on how to build a website, and setup a free domain name at the same time. If you are just looking to buy a domain, then you’ve come to the right place. Read on to learn how to register and setup a domain name in three simple steps. Before we go ahead to register our domain name, we need determine which one. When you are starting a new project, a good name is very important. That said, when it comes to the online world, you definitely want a domain to match your project name. While many folks claim that all good domains are long gone, that couldn’t be further from the truth. Sure, nouns and product names may be taken. But there is no need to be generic when it comes to your brand name. If you’re about to type every potential domain names on search engines, don’t. Use Instant Domain Search (my favourite) or Name Boy to check names for availability and more brainstorming. Name Boy will give you lots of suggestions and alternatives. And Instant Domain Search makes it super easy for you to check domain names availability within seconds. Now that you’ve settled on your golden domain name, let’s go ahead and grab it. Because domain names don’t wait for no one, my advice is to grab it as quick as you can before someone else does. Afterall, it will only cost you $10. 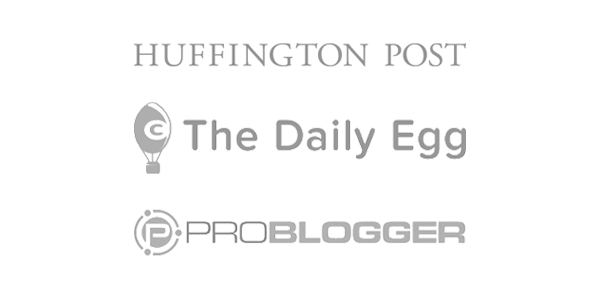 There are many domain registrars out there, my most recommended and the one that I use for Bloggingthing is NameCheap – check out other domain registrars here. To start — go to NameCheap (this link opens in a new window so you can reference this guide as you work). Type in your desired domain name on the white box with your desired domain extension. As mentioned above, I highly recommend .com. Because you’ve checked the domain name, there is no need to second guess it’s availability. You’ll be directed to a page with your domain name and the message “This domain is available!” underneath. 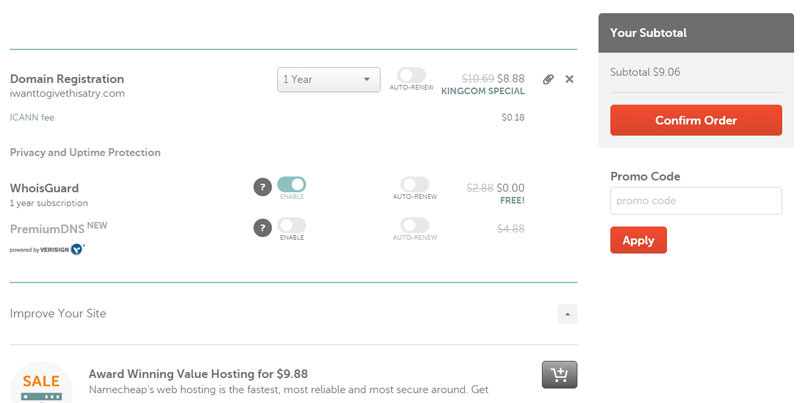 Click the black shopping cart icon on the right to add the domain name to your shopping cart. Then click the orange View Cart button on the right. Once you’re done, you’ll see your domain information and extra options. I would skip all of these and remove the free one year WhoisGuard as well. Why not use WhoisGuard privacy services? As a domain owner, your information and email address will be public for all to see. That’s where WhoisGuard comes in with services like “privacy services”, “whois masking” or “private registration”, where they offer to put their information in the whois record instead of yours. While this claims to help you prevent from spams, the important thing to note here is that in the eyes of the domain registry, whoever is listed in the domain whois record as the domain Registrant is the legal owner of the domain name. So if you use WhoisGuard, they basically own your domain name. While it’s unlikely you’ve end up in a domain name ownership dispute, it’s better safe than sorry. In my experience, I’ve not gotten any more spams after removing WhoisGuard. After you’ve chosen your domain name settings, you’ll be taken to the Create An Account page. This step is pretty straight forward, fill in your information with a working email address, then click Create Account and Continue. Now you’ll see the checkout page. Select your prefered method then click Continue. You’ll be redirected to another page to fill in your card or account information to proceed the payment. For example, my preferred method is PayPal, so all I need to do is click that yellow Checkout with PayPal button and login to my account to complete the order. Congratulations on getting your first domain name! Before you go and celebrate, here’s some tips on how to set up this domain name for your existing site. If you are hosting your site at a web host like BlueHost, find their primary and secondary nameservers. The information can usually be obtained from your host’s FAQs or other documentation on their site, usually under a category like “domain name” or “DNS” or “domain name transfer”. You don’t need to understand what these means. With NameCheap, after you’ve logged into your account, click on the Manage button on the far right, next to your domain name. Finally, click the green check mark button on the right. It usually takes 24 – 48 hours to point your domain to BlueHost (in my experience though, it takes less than an hour). In the meantime, click here to continue setting up your WordPress blog. Quick note: If you are using another domain registrar like GoDaddy, I’m not sure how it works but you can always contact their support team for directions. As our online world grows, there are a bunch of domain registrars out there to pick from. Here are a list of the best ones. Note that there are a lot of discounts, price changes etc. when it comes to domain names, so it’s impossible to come up with a universal price. That said, I will try to give you a common price for each registrars. Namecheap — My domain registrar of choice, Namecheap provides .com domains for as low as $10 per year (and $9 if you transfer from another registrar). Along with your domain, you get free email forwarding, free web redirection (where anyone going to your domain is automatically directed to another address of your choice), free domain name parking, etc. For the first year (or at least, at the time I checked their prices), you can also have their WhoisGuard (where your particulars are masked from public view) for free. They have a wide variety of domain name extensions available, including .net, .org, .biz, .info, .us, .co.uk, .co, .de, etc. Namecheap allows you to purchase with either a credit cards, PayPal or account funds. Dotster — Dotster is a fairly popular registrar provides domain prices around $15 per domain, a convenient web interface to manage your domains, an optional privacy facility where your domain name is registered in the name of a proxy company, etc. They offer .com, .net, .org, .biz, .info, .us, .ca, .tv, .name, .cc, .de, .sr, .md, .co.uk, .us.com domains, etc. 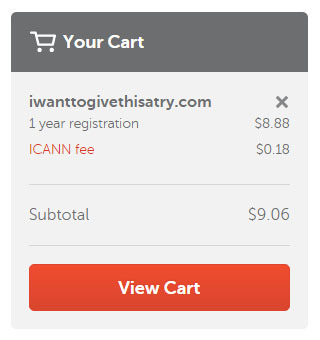 Their prices are expecially cheap if you’re transferring a domain from another registrars, at only $7. 1and1 — 1and1 is primarily a large web host that is also a domain name registrar. Like all registrars, there are different charges for different domain suffixes. For example, at the time I last checked, you pay $0.99 for a .com on your first year, then $14.99 per year thereafter. The fee includes private domain registration, which means that your particulars are hidden from public view (done by registering the domain in the name of a proxy company). You also get a free email account and unlimited email forwarding, DNS management, a free SSL certificate for your domain, etc. GoDaddy — While I don’t recommend GoDaddy because of their upsells, they are worth mentioning as one of the most popular registrar in the world that offers .com domain names for $9.99 per year (or $7 if you transfer from another registrar). GoDaddy offers .com, .us, .biz, .info, .net, .org, .ws, .name, .tv, .co.uk, .me.uk and .org.uk, etc. As mentioned above, most of the best web hosts out there will give you a free domain name your first years of hosting with them. 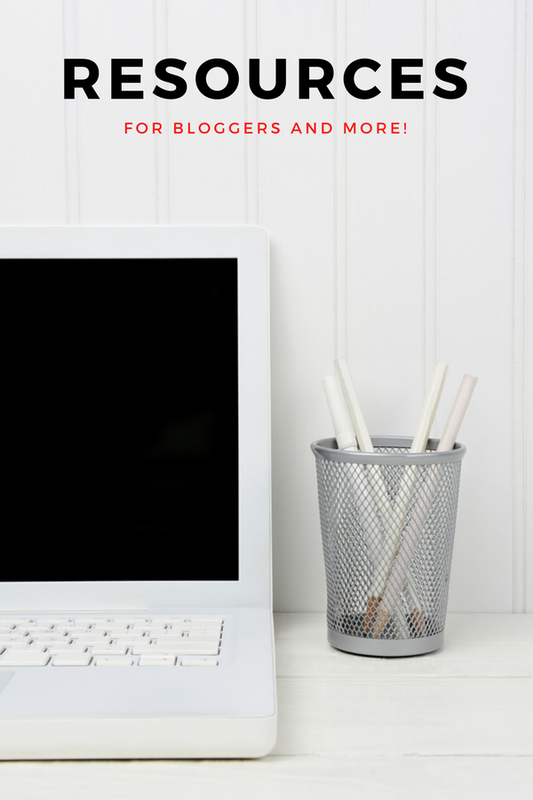 So if you are creating a new site altogether, read this guide to learn how to build a website and grab your free domain name. The best domain names wait for no one. If you’ve found one that really tickles your fancy, do give it a go so you won’t have to regret later. Fortunately, brand-new domain names is that they come in such a cheap price, at less than 1 buck per month. I hope this post has helped you register your dream domain name. Feel free to drop a comment if you have any questions about domain names, I’ll try my best to answer! I think this is a brilliant idea to have a step-by-step guide to buying a domain name. I have used NameCheap and they are very good. They have an excellent customer service dept. When I bought my domains previously I had nobody to guide me so of course there were teething troubles but NameCheap support team always resolved any issues. Thanks for this guide, really useful. 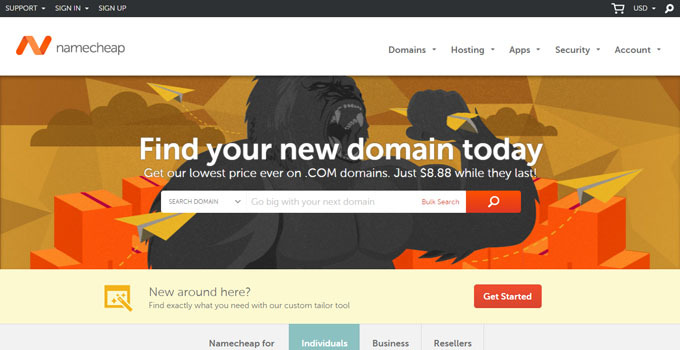 I’ve never known who to use to purchase domain names through and have never used NameCheap before. I’m slightly disappointing I’ve paid over the odds in the past, however will be sure to use this in the future. It’s my pleasure, Mike. Yes, some research can save your quite a bit. 🙂 I wish you all the best with your online projects! To get a domain name is indeed a difficult job. Certainly to get a name that entirely fits with your content. The tips you’re given me are very informative. I will sure take it with me when I register my next domain name. Thank you I will share this with my friends. Hello Anh, I like your tips on domain names. I made a mistake of putting hyphens in a domain name that I still own. It does make it a little more difficult for people to remember your domain name. A great domain name is key to your business or brand. I appreciate your article. I remember reading somewhere that it is best to buy a domain name that relates to the website you build. I would like to know what you think about all the other endings for websites. Like .net, .co, .us. Do you think they rank as well with search engines like the dot.coms does? Hey there, Loretta. There are myths that say .com TLDs are more friendly with search engines than the others, but there is no base to that assumption at all. I recommend .com for user-experience, because that’s what we are most used to. As far as SEO goes, it’s your link profile and site optimisation that will define your ranking. Great information about having your own domain name. I hope others can see the benefits of being in control of your own personal domain. That way you can express your own feelings and thoughts, and promote any type of products you deem beneficial to your readers. With the six pointers that you had listed for coming up with a domain name, I would definitely have to agree that people need to think hard and long about the name they want to use since it will be a lasting impression of their work and their business. Thanks for the info I will pass this along to others. Aww, thanks Angela for the kind words. Coming up with a domain name can be nerve wracking for sure. In fact, I’ve change my domain name once throughout my blogging life.